Farecla has released new improved G10 finishing compound a result of their dedicated product improvement programme which ensures that as technology advances and new materials become available they can continue to offer ideally performing products and technical support. Feedback from customers worldwide has resulted in Farecla introducing the new improved G10 finishing compound. The new G10 now delivers real benefits for paint finishing and is ideal for removing light scratches or swirl marks, especially on darker colours as well as restoring older paintwork and bringing the true colour back thus creating a glossy finish and ultimate shine. The new improved G10 finishing compound is self lubricating and silicon free. There is no need to use water, therefore with reduced splatter and virtually no clean up time there is a positive cost saving benefit for the end-user. 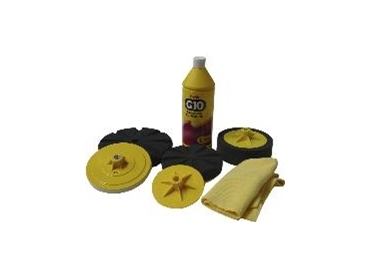 The new improved G10 finishing compound available from Australian Warehouse Distributors is versatile and can be applied either by machine or hand. For a high gloss swirl free finish in a short time, use the advanced G mop polishing foam which is available in 150mm or 200mm. For the ultimate shine use the Farecla finishing cloth by hand. The new improved G10 finishing compound is available in two bottle sizes: 500ml and 1L. Farecla’s full commitment and investment in research and development, and strong relationship with major global paint manufacturers ensures Farecla is at the forefront of technology and innovation, thus producing compounds for the fast way to a fine finish.